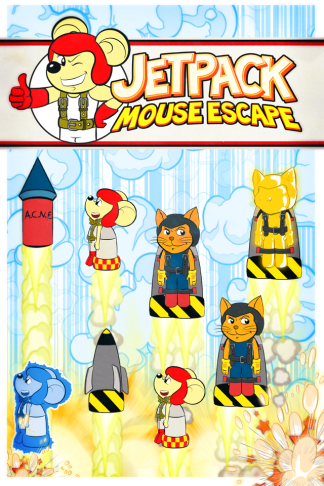 Test your reflexes while you help the mice in jetpack on their frenetic escape to the cheese moon – but be aware, for the cats will try and do anything they can to prevent our friends from reaching their goal. Have fun with simple touch controls – keeping the cats away, avoiding elusive traps, intercepting missiles and exploding fireworks – all this while enjoying captivating graphics in a retro cartoon style and a soundtrack that will make you feel like you were in a jazz concert in 1950! Pure vintage delight! This beautiful game was brought to you by Mgaia Studio, tradition in making iPhone games since 1950… just kidding!